1. Each set of alphabet (spelling) blocks contains 26 alphabet blocks (one capital letter per block and five different lowercase letters per block), one extra vowel block for each of the vowels, and one dot die. This ensures the blocks have enough letters to spell out the desired words. 2. Children can easily learn the uppercase and lowercase letters of the alphabet as each block that has a capital letter also has the lowercase version of that same letters on the same block. 3. The alphabet blocks, A through Z, are numbered 1 to 26, respectively, to make it easier for children to keep the blocks in alphabetical (and numerical) order. 4. The surface of each alphabet block that displays a capital letter and corresponding location number also provides a reference key to the letters shown on the other five surfaces of that particular block. This reference key makes it quick and easy to find the block with the desired letter(s). 5. 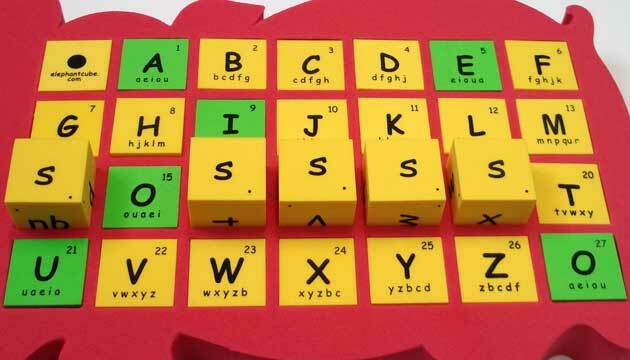 The alphabet blocks use one color for vowels and another color for consonants. Such color-coding helps children distinguish vowels from consonants and assists with understanding how vowels and consonants interact when spelling words. 6. The small black dot in the bottom right corner of the surface of each lowercase letter indicates the right position. 7. The alphabet blocks are conveniently arranged in alphabetical order to promote ease of learning the ABCs, finding the proper blocks to spell words, and putting the blocks away in an orderly fashion. 8. The display case is designed to be light, portable and facilitates easy storage. 9. 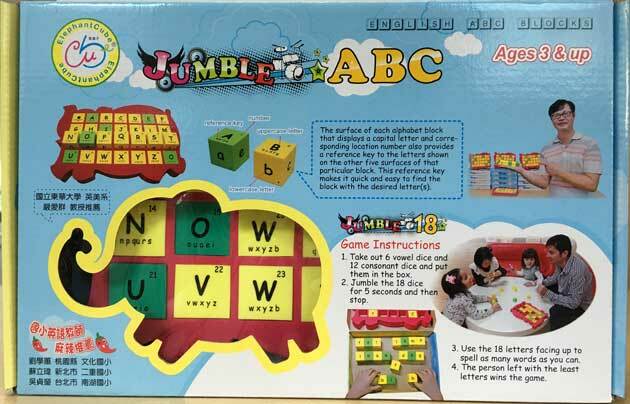 The alphabet blocks are suitable for individual use, pair games or group activities. Six vowel blocks (a, e, i, o, u). For every uppercase consonant that appears on a block, the lowercase consonant can be found on the same block, as well as on the four preceding consonant blocks. The blocks have enough letters to spell out the desired words (e.g. cheese, Jennifer, scissors, or communication). • The alphabet blocks assist children in learning spelling skills and vocabulary. 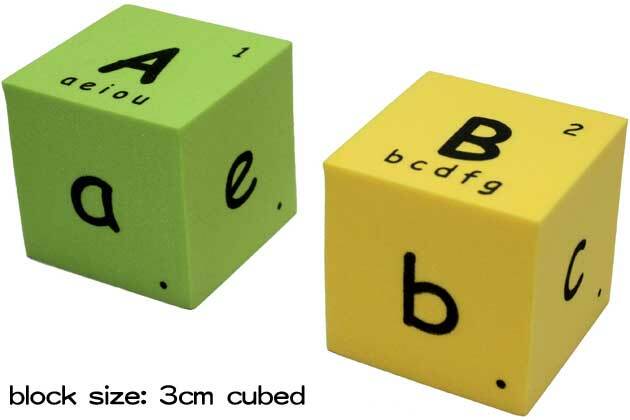 • Children can select blocks and assemble them into words. • Children can choose two or more blocks and roll them for spelling fun or rotate individual blocks to to learn to sound out different letters or combinations of letters. 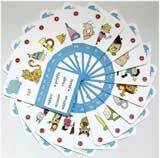 • The alphabet blocks may be used with most flashcards to play games or practice spelling and phonics. * Products colors may not be exactly as shown. All ElephantCube products meet or exceed the safety standards for toys.